Here we visited with friends that we met in Long Beach because of the Lutheran Maritime Ministry. Santanu is the first engineer on a MOL vessel. He’s a big quiet man with a shiny shaved head and a heart of gold. We enjoyed meeting he and his wife, Purba, during their last visit to Long Beach where we showed them around and served them dinner at our home. They insisted that we meet them here in India whenever we visited. They just got back from their European voyage 4 days ago and are thrilled that we kept our promise to visit them. Purba’s parents live with them and what a lovely and peaceful home they all share! They live in a private gated community. Purba’s sister is an architect. She & her designer husband created this very modern home with beautiful features. The floors are marble but it looks like wood. There are many unusual built-in features unique to this 3 story house. I think it is definitely one of a kind. Since leaving Mumbai (Bombay) on Saturday we've been to a city, Pune, about 1 1/2 hours drive from Harjeet's place. Captain Jimmy Shroff and his wife, Zendin, picked us up from Harjeet's and took us to their beautiful place in a development called Clover Highlands. We stayed with them over the weekend and then they went back to work in Bombay leaving us the keys and full use of their home! WOW! What an unexpected blessing that was. Very relaxing and calming. The second day in Pune we went to visit the famous India Union Biblical Seminary (UBS) where many of our friends studied and received their higher education. The students were busy in classes and the Principle was occupied with other duties but he took time to greet us and sent us with a student, Marine, from Mizoran. She gave us a tour and ask us to pray for God's leading in her life as she is a fourth year student due to graduate soon. It was an honor to see the school. Well, we made it! Even though the flights were long and tiresome, it actually wasn't too difficult to make the journey. It took us from Sunday evening 11:10 pm (LA time) until Tuesday (India time) about 8pm. As we waited in LA for the first leg of our trip, I told Chim that it looked like there were a lot of seafarers with us as fellow travelers. We flew on China Air so most of the passengers were Asian but there were a lot of men from the Phillipines there too. A man named Raymond was seating next to Chim on the flight to Taipei. He is a supervisor from a cruise liner in Florida. Of course Chim told him about our ministry and shared the Gospel message with him. Raymond opened his heart to the Lord and prayed to accept Him as Savior. Praise the Lord! Always on duty, even on vacation! Our good friend Harjeet met us at the airport with flowers and drove over an hour out of his way to help us deliver a suitcase to the brother of a missionary friend. (The brother will deliver it to his sister later. ) Harjeet's family had a lovely dinner waiting for us and it was a pleasure to meet them. They are a Sikh family and very religious. (Most Sikhs are Punjabi.) This family is vegetarian as well! 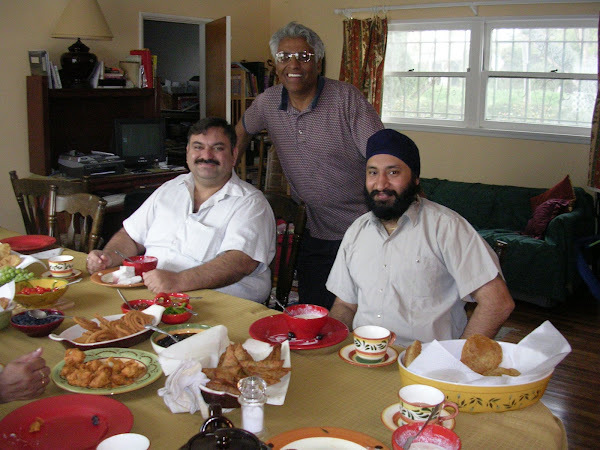 In fact, because Harjeet doesn't eat meat, he found our home in Long Beach a place where there was always a meal that he could enjoy. Thus our long friendship was born! The Lord has blessed our family greatly this month. We have a new grandchild born Friday the 24! Her name is Nina Savita and she weighted in at 7lbs 14 oz and 19 inches. 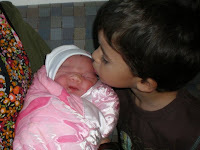 Our family is blessed with her arrival and her mother's save delivery. Matteos is a proud big 3 1/2 years old brother. Dad and grandpa can hardly get those smiles off their faces! Total of 10 ships for month of October were visited by both Chim and Hearen. We had a service and communion on the APL Spain at the Captain's request. There were about 16 crew members there. We had the opportunity to share Jesus with these men and Chim spoke about how Jesus meets the needs of people and impacts them. He used the example of the Samaritan woman at the well and shared how He gives living water from the inside out. We continue to have men visit our home. However, it seems that we are concentrating more on visiting ships for service because of lack of drivers to bring the guys to our home. This month 7 guys came one afternoon and helps us with a family problem...they moved the new baby's furniture upstairs. We served them dessert and gave our thanks to each one. Hearen and Chim spend some time with different crews taking them to Best Buys, Staples, Cosco and sightseeing. Usually about all they see in Long Beach is Walmart! Building relationship is still very important. Hearen is continuing to learn his way around the port. He has a heart for giving the Gospel to the mariners and never misses an opportunity to be used of the Lord. For more than a year, checks that arrived for LMM have been taken to Sadie Marsu, a member of our board. She has stepped up to the plate and has been delivering things to and from the bank. Last week she fell and broke a couple of ribs and fingers on her right hand. Please pray for her quick recovery. Despite her injuries she continues to run around helping others! Thank you, Sadie, we don't know how you do all that you do for LMM and others! We would like to take this opportunity to welcome Ms. Mary Steward, Mission Board chair at First Lutheran Church in Torrance. She has volunteered to join our board and brings many years of rich experience to the task. We are looking forward to working with her for many years. Ron Nelson, president of LMM, has agreed to help Hearen any way he can while we are away. Already busy with his position of Stewardship Specialist with the Synod, Ron has many responsibilities that take his time and energy. Please pray for continued strength and health for him. We could still use more volunteers for this ministry. Oh, and just to keep you informed, the Long Beach International Seafarers' Center is facing deep financial difficulties. They have had to lay off people and reduce their hours of operation. As of December, they will no longer be open on Saturdays for the seafarers. However, they are still open for Christmas shoe boxes and plan to distrube to the seafarers during the holidays. Chim has been busy making the introductions with Hearen to the following ships: Hyundi Discovery, Long Beach Bridge, YM March, MOL Profiency, MOL Prosperity, Rotterdam Bridge, ALP Spain. They had a communion service on board the Spain at the Captain's request. Hearen learnt the necessary steps to clear security at each gate at the different berths and also how to log on to each ship at the gangway. He has also been driving to the different terminals learning his way around, studying roadway maps and learning how to check on when the ships arrive at each terminal. The Bishop's dinner was a success. We enjoyed very much having the opportunity to meet supports and interested people. Hearen brought his family too and Ron Nelson had the chance to introduce them at the gathering. LMM gave away copies of the newsletter (from on line) and we meet someone interested in joining the board of directors, Mary Steward, from Torrance Lutheran. Welcome, Mary! other shaving items-colone, aftershave, etc. or anything else small enough to fit into shoe box! We are requesting that bars of soap not be include because even if they are wrapped, the soap gives off an odor that everything else absorbs. Today Chim and Hearen brought home 2 seafarers and an officer's wife. They were all Indians from different states in India. I gave them creamy toasted eggplant curry, white northern bean spicy soup, chicken curry (keema) along with cabbage and carrot sambar ( cooked salad), rice, yogurt and nan. Oh, I also had made some potato & peas somosa (like Mexican espanos). I think they enjoyed the meal...I know Hearen and Chim did because they had seconds! Well, as I write this entry, Chim and Hearen are out working with the seafarers. Oh, Chim just walked in with a ship's captain. I have to make tea for them and lay out some cookies. More later. Sunday we will be at the Bishop's dinner in Torrance and hope to see some of you there too! Please stop and say "Hi" if you spot us! Yes, thanks to retirement and the Lord's leading, we are traveling to India soon. Because of this we have been praying for someone to come along side and work with us. We feel the Lord has answered our prayers. Hearen Christian is a lovely, dedicated man that loves the Lord. We have known him about 5 years. He has just had time to open up to be able to work with us. He lives in Whittier but has shown determination in joining Chim several times a week to learn the ropes about seafarers. Please pray with us that Hearen is the answer to our prayers. He has a driver's test on the 16th that he needs to pass in able to use a car instead of taking the bus from Whittier to Long Beach. (He's been driving for years but not in the USA. He is from Bombay, India). Sunday, Oct. 5th, the Long Beach Bridge was in port with Burgess, and his wife Nazneem. As you may remember from last month's newsletter, he's the chief mate and there was a new Captain we had not met before on this vessel. They invited us on board for dinner and it was a pleasure to be with them. After dinner the Captain allowed Burgess time off and he and his wife came to our home. We gave Burgess time on the computer and then we played Mexican Train Dominoes with them. The next day I arranged for Nazneem to see a local doctor in Long Beach about a personal problem she didn't want the company doctor to know about. She was relieved to find her disorder was a simple one to resolve. Chim joined them on board ship the following day for lunch. The next I spend shopping with Nazneem to her heart's content until Burgess called after lunch and we drove down to the port and he joined us for the afternoon's shopping session! At the same time that I spent with the LB Bridge, Chim was working on a separate ship. He picked up Raj (Chief Engineer) and they had a good discussion about the Lord. They also had time to play a game of golf together! This officer was from the Yang Ming March. 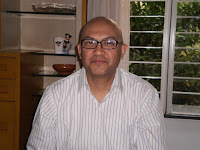 He liked Chim and invited us to spend time with he and his family when we travel to India next month. He also accepted some Christian testimonies on DVDs from Chim that he promised to watch and discuss next visit. Ministry continues on the MOL Partner and the Yang Ming (YM) Great. Chim continues with the help of the Lord to serve the men's needs and provides as the opportunities come. Eight crew members attended a service Chim had on board the YM Great. The 3rd officers assisted in the service. The men feel very comfortable with him. Enough so that they particated with Chim in the Believer Confession of Faith and again heard the Gospel message. The LMM board met this month and discussed the need for additional board members and some help for Chim. Chim and I are planning an extensive journey to India where we will be visiting various crew members that have sign up in our address book. Many of these guys have become like members of our family. Please pray with us that the Lord will provide help and a co-worker that could continue with the minstry while we are away. The Long Beach Bridge was in port with one of our favorite 1st officers, Burgess. We last saw Burgess on the Yang Ming March about 18 months ago so it was a great surprise when he phoned and said he found our business card in the crew's mess hall. He was shy to call us because he hadn't been in touch for so long but we welcomed him back with open arms. He had another wonderful surprise for us...he had gotten married and his wife, Nazneem, was with him. Of course we picked them up and showed them the town and had a fabulous time together. Chim has been driving down at the Seafares' Center 2 to 3 times a week and making new connections with crew members. He's been talking one-on-one with seafarers, praying for them and driving them around as needed. A Chief Engineer on a MOL ship was so impressed with the work Chim does that he donated $100 to the ministry! Chim plans to give him some Christian DVDs on his return. The 2nd officer on the same ship also gave $20 for the ministry. Chim gave a Muslim crew member a DVD about a Imam cleric becoming a believer. Pray for an opening to discuss at a later date. Yesterday we went to the Queen Mary for the Annual Fund Raiser for the International Seafarers' Center. It is always a lovely event and the major fund raiser for the Center. It gave us a door to witness to others there. The original Lutheran founder (Father Bartlett) of the Seafarers' Center gave grace for the meal. He has been here since the beginning of the Center. August is in full swing from the beginning! Chim has been busy since last Thursday. He has visited the Hyundi Discovery, MOL Proficieny, ITS Rotterdam Bridge as well as volunteering at the Seafarers' Center in the evenings. He has taken seafarers shopping in the Lutheran Maritime van, shared the Gospel with the crews, prayed for individuals. Yesterday he prayed for an ordinary seaman (that's what his position is called) prior to his departure for India. Mr. Singh had fallen while working on the lashings of the cantainers while the ship was at sea and had to wait 10 days to reach the port for treatment. He was in a lot of pain during that time. Chim prayed for him with another believer before he left for recovery in India. ITF (the seafarers union) was on board with Chim, so thankfully, Mr. Singh will receive compensation properly for this injury. Chim had lunch with the crews of the Proficieny and the Rotterdam Bridge on different days. He was able to get better accquainted with the men and then he dropped them for shopping and later picked them up again. He also drove the captain and the first engineer to Cosco for shopping. This helps open doors for later ministry. Yesterday Chim ask me to do some touring with the captain and first engineer from the MOL Proficiency. I first took them to the Japanese Garden at Cal State LB where they were surprised at the peace and beauty. They fed the lovely koi fish and then I showed them some of Naples and the canals there. After that we drove down to San Juan Capistrano and we toured the Mission there. Later I dropped them at Cosco for shopping. Chim picked them up later and he said they were in awe of all that they got to do that day! Needless to say they had a day that they wouldn't soon forget. As I was writing this entry, we just received a phone call from Romania! George and his wife Romana called after receiving our latest email to them. They had just returned from another trip to the mountains where they had taken Chim and I in June. On this visit, they had seen wild bear that actually came up to their car begging for food. We enjoyed a nice long phone visit together. It's great to be able to visualize them talking on the phone with us while seated in their kitchen where we played the card game Uno late into the night together just a few weeks ago! It's nearly midnight and they didn't want to disturb Ginger, their 4 year old daughter. I am sending them copies of some of the photos we took together. Well, let me close for now. Chim just left to go join another ship which I'll tell you about later! Bye for now! Sunday, July 29th, Chim and Fay visited the Lutheran Church of Our Savior, ELCA, on Sierra Way in San Bernardino. We spoke with the congration at two services. We were able to present a PowerPoint presentation featuring the responsibilities of a chaplain for the seafarers. These responsibilities include providing for the seafarers spiritual needs, transportation needs, communication needs (providing cell phones and computer access), visiting the sick and hospitalized when needed, visiting the ships and praying for the vessels and crews. Providing Bible study and the Gospel is also done as the Lord opens the doors. We also feel that inviting the crews to our home for fellowship and a home cooked meal or snack is part of our responsiblities as these activities have a huge impact on the mariners. The folks at Our Savior were very welcoming and encouraging to us. Once again they provided many, many Christmas gift boxes (wrapped shoe boxes with personal toiletteries). Last Christmas at the ports of Long Beach and Los Angeles, we gave out about 3,000 gifts mostly provided by Lutheran churches! Many of the boxes contain homemade "watch caps" which the men use at sea to keep their heads covered and warm while on duty. Many people at Our Savior gave us gifts of money to be used for the seafarers. We were very grateful for their thoughtfulness. After our visist we felt refreshed and strengthen by the warm fellowship and support provided by Our Savior. In fact, as soon as we arrived home, Chim was out the door again to visit the Yang Ming March that had docked the previous night. We have a long relationship with this ship and her crew as we have been able to visit her since her maiden voyage some years ago. She has a complete new crew and as well as a new Captain. The Captain ask Chim to pray, give communion and to bless the ship before it sailed. This is particularily unusual as the Captain is an Indian of the Hindu faith! He simply said he wanted his ship blessed and we were the only ones willing to do it! Yesterday was my first experience of accompanying Chaplain Chim Mandalia on a ship visit. 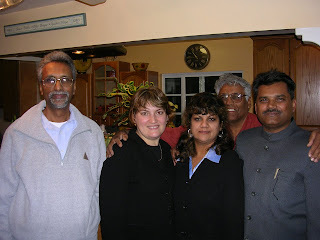 My wife and I were his house guests on transit from Guyana to India. We reached the port quite early and were waiting for the bus to take us to the ship. Bro Chim was carrying a box full of Gospels, New Testaments and Bibles. I realized that it is a hard job, carrying these boxes and climbing steep steps of the ship, day after day. The bus dropped us near the ship. When we climbed the steps, there was no one on the reception place and we had to wait patiently for the man to come and let us in. Again we had to wait in the Ship Office for sometime before the officer took us to the dining hall where we had the service. The Captain walked in and welcomed us warmly. He appeared to be extremely happy to have us visit and bless his ship and the crew. The were sailing the same evening. The service was very good. Bro Chim explained the gospel clearly from john chapter 3. The crew listened well. During the Holy Communion service I could further explain the gospel and allow them to pray, before the prayer of confession. After the service, the captain spent some time with us. He is a middle aged gentleman from a Hindu family in India. He appeared to be greatly blessed by the ministry this morning. When he took us to the bridge, we prayed with him and blessed the ship, the captain, the crew and their families. His eyes swelled with tears and he was very grateful to God for His blessings. As we were coming out, a sailer came and shared about a death in the family, another wanted a Bible to read, and the others thanked us for coming. We were very touched by their response. One of the crew wanted to check his emails as he had left his wife just after their first baby was born. Bro Chim took him home and allowed him to use the computer. Sis Fay and my wife dropped him in the port when he was through. I am very grateful for the ministry to the sailors. It is like Philip meeting the Ethiopean Officer on the road and ministring to him. History says, the gospel went to his country through him and blessed the land. The Day of the Lord will reveal how many families and nations were blessed through this effective ministry. As a family we would like to continue to be prayer partners with this ministry to sailers. 2nd week of July starts with a bang! Sunday, July 6th, Chim was able visit 3 ships and 4 crews. Cosco Yokohama came back from the European route after 6 months. Most of the crew was European and some Pilipinos. Chim was able to provide their needs for phone cards and telephones. Chim was able to visit MOL Prosperity and the crew was excited to see him again. Good to see some old friends on board but new Captain and Chief Engineer. Took them to "Little India" in Artesia for a good dinner and then touring in Hollywood. This is always a treat for the seafarers. After dropping them off, Chim found 3 cadets and the 3rd Engineer from a Maersk ship and brought them home with 4 guys from another ship. We gave them snacks and freedom to use the computer and telephones and just make themselves at home. We stocked up the new Indian lads with some store bought Indian food we had on hand. (European ships don't usually cater to the Indian palate!) The new cadets were particular amazed at this hospitality. After leaving our home Chim took the 8 guys all to Walmart until closing. He then dropped them back to the ships they came from. Monday, July 7th, Chim picked up the 2nd Engineer, his wife, 3 year old daughter, 4nd Engineer, and the wife of the Chief Engineer from the Prosperity. He took them to Best Buys, sightseeing in Signal Hill, Cosco for shopping and then brought them home for fellowship and a bit of home time for them. In the evening Chim took them back to the ship and proceeded to pick-up a crew (6 people) from Maersk. One of the seafarers had a stomach problem and ask to hear Chim's testimony. Chim later prayed for him. Tuesday, July 8th, Chim picked up some crew from Yang Ming March for drop-off and then he proceded to pick up our telephones from ships leaving the harbor. This week found Chim very busy as he visited at least one or more ships each day before the holiday (4th of July). He found one Chinese ship where only one officer had a shore pass - so Chim took both phones down for the crew to use to call home. He spent a whole day with the Chief Engineer from that ship helping him get all his shopping needs taken care of. On Tuesday the Lord brought a man that we had visited on a ship 2 years ago back into our lives. Lobo, from India, reminded us that we met on the Yang Ming March when Captain Bhati was in command. We clearly remembered him. He had lost our card and therefore contact with us. Anyway, he ask if he could come to the house for prayer! Chim invited him home and we had a lovely, unhurried time of Bible study and pray together. Later we had a barbecue lunch on the front patio that included tandoori chicken, grilled shrimp, rice and salad. Lobo was thrilled that he had so much one-on-one time with Chim and very encouraged in his Christian walk. We also shared the joy of fellowshipping together with him and felt encouraged that he wanted to pray with us. they are ever full of sap and green"
time seeking Him and spending time in His word! Chim has been out all day with seafarers touring Hollywood and other areas. He had to borrow a larger van from the Seafarers' Center to accomate all the guys that wanted to come on the tour. This gave the men great pleasure and began a friendship with the Chief Engineer (CE) of one the ships Chim visited. He was able to witness to this man about the Lord with four or five other men in the ship's office later. Chim was able to give the CE a DVD relating to the Lord. The CE promised to watch it and give Chim his opinion later opening the door for another visit later. Chim visited the MOL Proficiency where all the deck offciers were Indian. He also had time to see the Hyundai Discovery where he met with six Indians, 3 Philipinos and an Irishman! He gave them rides to the Lakewood Mall and basicially made connections with the crews for the next visit. We received a call from Romania from George for Fay's birthday yesterday. It was a treat to talk with him. We had such a great visit with he and his family in June. June 27, 2008- We returned from our European adventure on June 16th. After about one week Chim was able to return to the Seafarers’ Center for service to the people there. He has worked a couple of afternoons and each evening this week with the Seafarers. The staff at the Center are very happy he is back in his supportive position again. 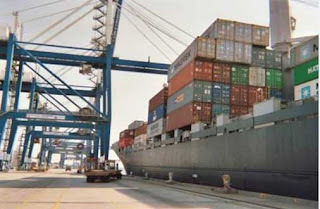 Over our break we continued to have email and phone contact with seafarers, however, services to the people in Long Beach came to a standstill during our absence. This is a concern because Chim is planning a trip to India in the fall and is worried about who will carry on the services he provides to the seafarers. Besides spending time with George and his wife in Romania, we were able to met with another seafarer and his family. Sorin, Solmonia and their son, Andr, met us for dinner at the Motor Café on the Beach in Constanta. We had a great time together and enjoyed this experience. We left messages for other sailors we were unable to get together with and expressed our regret that we missed them-Stephan and Rodu. Chim had an opportunity to witness on Monday to two Americans, Joe and Chris, about Christ and Chim’s experience with his faith. He gave them both copies of the Gospel of John. He also met the chief officer from the ITS London Bridge taking him to Best Buy and Circuit City and spend the afternoon talking about the Lord with this man. Three other crewmembers joined them. April 7, 2008- Last night the Lord gave us an unexpected blessing when Chim brought four men home from the Seafarers’ Center. Chim had spent the evening with the Captain from the Yang Ming March. He drove him to all the places the Captain wanted to go. We had already given this man a lot of attention over the weekend. We took him to breakfast and then to church with us where he heard the Gospel message. After church we spend the rest of the day with him; we toured the La Brea Tar Pits, Natural Science Museum, Hollywood, saw the Crucification at Forest Lawn in Glendale and then on to Bakersfield to meet some friends and hear a special Evangelist speak. It is sometimes hard to spend time with the men when the Captain is so needy. However, after taking him shopping and for dinner, Chim took him back to the ship and when looking for some of his crewmembers. At the Center Chim invited these four seamen to our house. One of the crew, the 3rd engineer from the Philippines named Deo gave us his testimony as we sat around enjoying tea and cookies. He was so encouraged to have Christian fellowship. The other men, one Hindu and two Catholics, heard his testimony. Deo said that this time was God appointed. He was so excited and relieved to have time to talk with other believers. He feels God is calling him into ministry. Please pray for Deo. Chim encouraged Deo by talking about Jonah and his resistance to doing God’s will. Vinod Kumar from India gave his testimony and again the men heard the Gospel message.